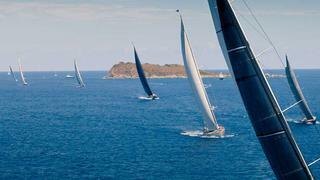 The Mediterranean superyacht season is set for a thrilling start as the Yacht Club Costa Smeralda (YCCS) welcomes an impressive fleet of 21 sailing superyachts for the Loro Piana Superyacht Regatta, taking place 4-8 June. Registration opens today, June 4, with four days of racing kicking off June 5. Racing will take place against the stunning backdrop of the La Maddalena archipelago while social events will take place at the YCCS Clubhouse in Porto Cervo Marina. Organised by YCCS and Boat International Media, the event has been held annually since 2008 and has fast become a fixture on the Mediterranean racing circuit. The fleet, with an average length of more than 34 metres LOA, represents the cream of international nautical design and construction and hails from some of the world’s top shipyards. Participants include 45m Fitzroy Yachts Salperton, winner of the Loro Piana Caribbean Superyacht Regatta & Rendezvous in March of this year, 45m Wally 148 Saudade and the World Superyacht Award-winning, ultra-modern 49.7m Fitzroy Yachts Zefira.